The only thing my tomboy six-year-old daughter wanted for her birthday was a Ken Doll. So we got her a Ken Doll. That’s DaviN, with an N at the end, not DaviD. DaviN. She invented this name herself and it’s been her favourite for several years now. She has many bears and dogs named Davin but now that Ken Doll Davin has entered the picture, all others have been forgotten. She LOVES her Davin. He’s never far from her side while she is at home. The only reason why I have the above photo of Davin is that she started crying in the mornings when she had to go to school and leave Davin behind, so I took this picture and printed it out and put it in her backpack so she could sneak peeks at Davin all day long. It’s like her own personal Teen Beat magazine. He makes a pretty good son-in-law, I have to say. He likes to sit on the couch with us in the evenings, sipping tea (he has a touch of the British about him, despite the surfer dude appearance) and making snarky comments about The Amazing Race. Any future boyfriends of Gal Smiley have a LOT to live up to, I tell you. So after we’d had Davin for a week or so, Gal Smiley started making noise about having other outfits for Davin. We have tons of Barbie clothes, left over from when FameThrowa and I were children, but we never had a Ken doll so there are no Ken clothes. I naively told her that I’d get her some Ken clothes for Davin, but you know what? Mattel doesn’t make them anymore. They don’t sell separate Ken doll clothes, at all. NOTHING. What up, Mattel? The major pattern companies don’t make Ken doll patterns anymore, either — just one or two Barbie patterns each. Ken is totally getting stiffed, I tell you. So I hit up eBay and got myself an 80s era Barbie and Ken pattern. Then I spent all Thanksgiving weekend with a wicked cold, hunched over the sewing machine. I have lots of sewing experience – I’ve made lots of clothes for myself, from shorts to jumpers to blouses to prom dresses – but trust me, there is nothing so frustrating as trying to sew working cuffs on a shirt for a Ken Doll. By Monday, I was hand hemming tiny sleeves on the world’s smallest blue velvet smoking jacket and wondering how my mother managed to remain sane. I’m sure I would have given up, but Gal Smiley came by on a regular basis with Davin to let me know that they both LOVED ME SO MUCH. So that made it all worth it. And in the end, dude is STYLIN’. Wow, that smoking jacket is SMOKIN’ ! Well done Lynn and looking good Davin! So funny! 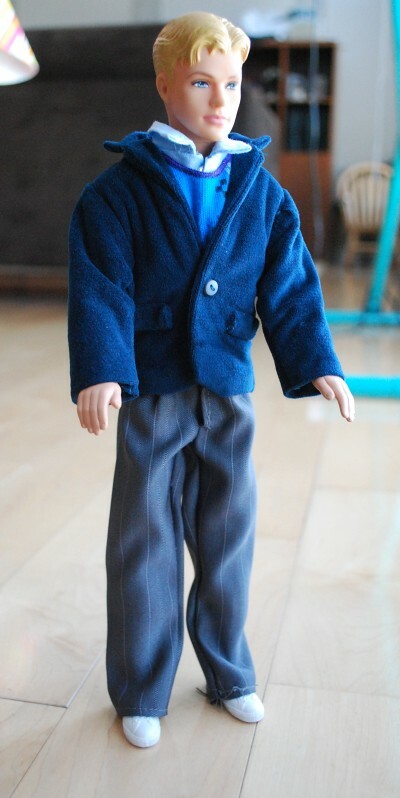 My mom made my Barbie & Ken clothes too… but nothing, and I mean nothing as stylin’ as Davin’s outfit. Good work! But couldn’t you just find the clothes themselves on eBay? I know that’s what I’d try to do in that situation. I’d bend over backwards in many ways for my kids, but making doll clothes from a pattern – that’s another universe to me. You are such a cool mom! That’s awesome. that’s so weird, though, about not being able to find clothes for him. Hana has a Ken doll and I got some clothes for him just a year ago (it was a package that had a ball gown for a Barbie and a tuxedo for a Ken. I love the names that kids come up with for their dolls and stuffies. Hana has a little stuffy bear called Hyanna. Where she got that from, I have no idea. Truly awesome. Yep, Davin is one hot looking dude. Well done. Davin is ROCKIN’ that outfit! i think it’s ridiculous that they don’t sell Ken clothes. why sell ken? i had a ken, but don’t remember changing his clothes much. barbie, well she was a little fashionista with several wardrobe changes per minute. and my mom made some clothes for our barbies as well. crazy. as meanie said “i bow down to you” and your awesomeness. Has anyone broken it to her that Davin is queer as a three-dollar bill? 🙂 Also, mad tiny sewing skills. Seriously woman! You are amazing! Mother of the year for sure! Love it! His look is even more FABULOUS than I imagined from your description last evening. But we need a close-up of those working cuffs!! Oh, I am doing a big catch-up on you blog … and holy cow, between the election one and this one, I have tears streaming down my face from laughter!! I don’t have a single Barbie or Ken doll in my house. My DD just never wanted any. And since I grew up in a house where my mother didn’t believe in Barbie dolls, I’m pretty used to not having them around. But just seeing this photo reminded me of going off to my girlfriend’s house … she had two sisters and between the three of them, they had every Barbie and Ken thing ever created! Blow-up furniture, the camper van, a pool! Okay … sorry, I got lost there in my own memories. Just wanted to write a note to thank you for these posts. Also, I went out with a guy named Davin in university. That’s right, Davin. He was cute, but dark hair. And more rugby than surfer. There is a real life Davin??? That’s awesome. we totally predict that we will have at least one grandson named Davin someday. Sir Monkeypants predicts that now that I’ve written this post, the name “Davin” will appear on all the top baby name lists next year. You read it here first! Check with LittleSis. She had a Ken doll and might still have clothes for it. And I don’t think her boys will want to play with it, so she might be able to donate them to GS. Mom called yesterday and she was in Toys R Us and they had three outfits for sale for Ken, with shoes!! She snapped them up and the Gal is getting them for Christmas from SocialButterfly. I’m still on for making PJs, though. Is it wrong that I’m just a little turned on by Davin?